FCRA Protections for Employee Background Checks | The Consumer Law Group, P.C. Many people believe that the Fair Credit Reporting Act (FCRA) deals exclusively with credit reports, but, in fact, it regulates how information is collected and used for a variety of consumer reports, including driving records, criminal records, employment verifications, and education verifications. Common violators of FCRA include credit bureaus and consumer reporting agencies, but violations are also committed by employers and landlords running background checks. 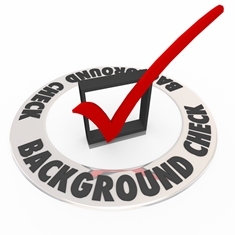 Obtain consent from an applicant to conduct a background check. Provide a consent form as a standalone document. Provide rejected applicants with a summary of their FCRA rights. Provide rejected applicants with a copy of the report (credit report, criminal record) upon which the rejection was based. Inform applicants or employees of their right to dispute the accuracy and completeness of a consumer report. If you are rejected for a job because of inaccurate information contained in any public report, you can take steps to correct the information. FRCA guarantees this right not only for credit reports, but for criminal records and other public reports as well. Employers are within their rights to ask questions about your past in order to make a decision about hiring you. They may ask about your employment history, educational background, criminal record, financial history, and use of online social media. However, an employer cannot ask an applicant for medical records until they make an employment offer. Even then, it is illegal for them to ask for genetic information except in very limited circumstances. If you believe your rights have been violated, contact the Federal Trade Commission to report the employer’s actions. If you believe you have cause to pursue legal action against the employer for violation of the Fair Credit Reporting Act, fill out the “Do You Have a Claim?” box on this page or call our office at 804-282-7900. If we take your case you will not owe a legal fee.